After his defeat in the battle of Long Island, New York August 27, 1776, George Washington was greatly troubled as to what he should do. He had withdrawn his forces to New York City, but he knew not whether it was wiser to stay and defend the city or to fly to a place of greater security. The outlook was dark indeed. A fourth of the army was sick; a third had no tents; and a large number, chiefly new recruits, were short of clothing, shoes, and blankets. Altogether the patriot army numbered only 14,000 men fit for duty, and these were scattered along a distance of twelve or more miles. The British army of 25,000 brave and well-trained veterans lay encamped in front of them along the shores of New York Bay and the East River. Moreover, the British had a large fleet of warships lying at anchor and ready for service, while spy ships sailed about continually, watching every movement of the Americans. Winter was not far away, and Washington feared the effect upon the patriot cause, if no effort was made to attack the British; yet it must be made in the face of almost certain defeat. His raw, suffering troops had little chance against twice the number of British regulars. What should be done? Washington’s headquarters were in the home of Robert Murray, a Quaker merchant, and here he called his officers together to consider the grave and perplexing question. It had just been decided to move northward to Harlem Heights — a position much stronger than New York, as it allowed for a more open line of retreat if that were necessary; for Washington had no intention of being surrounded on Manhattan Island for the winter by the King’s forces, or, more probably, of losing his entire army in one swoop — when scouts came hurrying with the news that the British seemed to be getting ready to move. But no one knew where they were going. “Gentlemen,” said Washington, “the fate of our army depends upon our finding out the plans of the enemy at once.” As all agreed to this, it was determined to send a spy into the British camp to pick up all the information he could find. Washington entrusted the matter of finding the right man to Colonel Knowlton, one of his aids, who had greatly distinguished himself on many occasions. It proved to be a difficult task. All who were capable of filling the part shrank from it. At last Colonel Knowlton thought of a clever scout who had undertaken many daring deeds, and was noted for his rashness and bravery. He was sent for; but the perilous task was too much even for him. The penalty, if captured, was too dreadful to contemplate. He turned in surprise. The voice was that of Captain Nathan Hale, a brilliant young officer, scarcely recovered from a severe illness. Hale’s friends pleaded with him not to go. It was madness, they said, for one whose prospects were so brilliant to undertake so perilous a mission. But Hale was not to be dissuaded, for he did not consider the value of his life where his country’s needs were concerned. 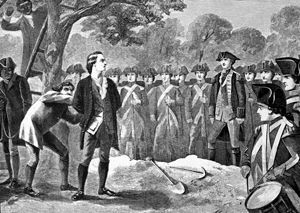 Nathan Hale was Captain of a company of Connecticut volunteers. His men fairly worshiped him. He was the steward of their rations, clothing, and money, and the sympathetic confidant of every lad in his regiment. He was a careful student of military tactics, and often served on picket duty. But, in spite of all this, he found time to arrange wrestling matches for his men, to play ball and checkers, and, on Sundays, to hold open-air religious services. He was born in a little old-fashioned house in Coventry, Connecticut on June 6, 1755. Eight brothers and three sisters made the home a bright and joyous place. Both father and mother were people of sterling worth. Mr. Hale governed his family in strict Puritan fashion, in fear of the Lord. He was very loyal to his country, and, after the war began, all the wool raised on his farm was made into blankets for the army. Three of his sons he dedicated to the ministry. Nathan was one of these. As a lad, young Hale was bright and active and filled with a love for all boyish sports. He liked books, and read with interest everything that came his way. He entered Yale College at the age of 15, and graduated in 1773, just two years before the Battle of Bunker Hill. Shortly afterwards he entered upon the career of “schoolmaster,” and was later elected principal of a select school at New London, not far from his home town. Professor Hale was well liked by all his pupils. He earnestly sought to implant in their minds the principles of courage, manliness, and patriotism. On the playground, as well as in the schoolroom, he was their leader. No one was a better wrestler or ball player. A company was formed at white heat, and marched for Cambridge the next day. The same promptness and dispatch marked his conduct after accepting Washington’s mission. Within a few hours he had taken leave of his friends and, in company with one of his own trusted soldiers, lay in wait for an opportunity to cross Long Island Sound. This was an impossibility in the vicinity of Harlem, on account of the British spy ships patrolling the Sound. So Hale and his companion crept stealthily along the Connecticut side until Norfolk was reached — a distance of 50 miles. Here a sloop was found to carry Hale across to the other side. En route he changed his uniform for a suit of citizen’s clothes, and landed on Long Island as a schoolmaster in search of a school. Of course, he “accidentally” stumbled into a British camp and at once began to make friends with the dragoons, who, as Hale was a most likable young fellow, received him cordially. Thus two weeks passed away. Hale journeyed from one point to another, always keyed to the highest pitch, and scarcely sleeping at night, so anxious was he to make note of everything which might be of service to the American cause.